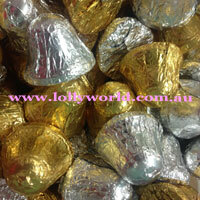 Chocolate Bells in silver and gold foil are solid milk chocolate made by Pink Lady in Australia. Great for Christmas tables or in little jars for gifts. Perfect also for wedding bombonieres.